It is hot outside today. A scorcher. I, for one, love warm weather thanks to my days growing up in sunny Florida. But living in the Midwest has given pause to my days of sun and warmth as the majority of the year is spent under gray skies and sub-freezing temperatures. Thus, any day that is both sunny and warm is beheld as a treasure to me and many of my fellow residents here in Chicago. The blessing of sunny days and warm temperatures bring out some of the things that I adore about the city, including the numerous festivals, outdoor concerts, and sailboats that dot Lake Michigan from June through September. But, inevitably, the summer heat makes me crave one of my favorite drinks: a smoothie. I cannot remember my first smoothie. But I do remember the first time I went to Jamba Juice. It was in the Fall of 1999 in Palo Alto, California, and the smoothie company was a huge hit. A classmate of mine directed me to the small store that was on Stanford‘s campus where I ordered a Strawberries Wild smoothie and fell in love! I cannot tell you how much I enjoyed that first smoothie. It was almost like a light came on for me. I have always eaten fruit, but I have never been a big fan of eating a lot of fruit. So, when I realized that I could have multiple servings of fruit that doubled as a healthy-er alternative to a milkshake, I was sold. Although I am still a huge fan of Jamba Juice, I realized later that I could make similar smoothies at home with a little practice and a great blender. Not only are they just as good, but they are less expensive to make since I control the ingredients. I like to dress my smoothies up in a wine glass. My smoothie recipe is very simple, yet highly customizable: fruit, yogurt, milk, and juice. I use fresh fruit that I freeze (store-bought frozen fruit is just as good), soy milk (I am lactose intolerant but any milk–nut, rice, cow’s, etc–works fine), vanilla yogurt (I prefer low-fat, but fat-free or full fat is ok), and whatever juice is in my refrigerator at the time. Over the years I experimented with different types of fruit but have found that I tend to return to strawberries, bananas, and mangoes as my top three choices. Not only does this “treat” taste good, but it is a welcome and refreshing drink on a day like today. So go ahead and have fun experimenting. I am going to get back to enjoying the sun. Place all ingredients in a blender and blend on high until smooth. If the mixture is too thick, increase milk and/or juice until desired consistency. Today I ran 3.25 miles. You read that right: miles. Now, for those of you who exercise frequently, 3.25 miles may not seem so daunting. However, for me, it was definitely a milestone. 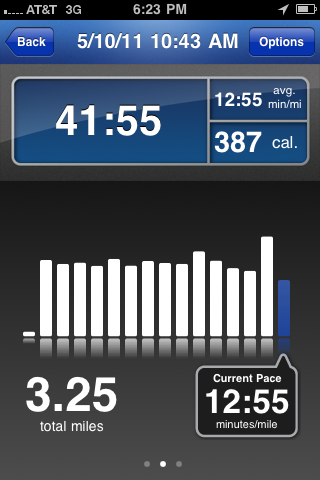 Screenshot of my run via the RunKeeper iPhone app. You see, way back in high school I was on the track & field team, weighed about 40 pounds lighter, and ran pretty regularly. By no means was I a star athlete. In fact, I joined the track team to “get in shape”. But during a typical practice we ran at least 2-3 miles before beginning our intensive training. I wonder, at times, how I was able to maintain such a rigorous regimen. Nevertheless, the work-outs under Coach Chisholm helped to instill an appreciation for working out and being healthy. I didn’t gain or lose the “freshman 15” as so many of my friends experienced. I was generally the same weight throughout my time as an undergraduate. And, I worked out fairly regularly, maybe once or twice a week. But, I did not pay too much attention to my weight nor my physical appearance as I was a bookworm and was more concerned about making A’s and getting into graduate school compared to clothes, clubbing, or boys. Well, maybe not the boys. I realized that my metabolism started to take a nosedive after my 25th birthday. And, on top of that, I found out that I was lactose intolerant. The latter was such a shock to my system as I loved milk and cheese and cream cheese on a bagel and cheese and yogurt and cheese… (you get the picture). I did not cut the dairy out completely–thank goodness for supplemental lactose pills!–and I found an acceptable substitute in soy milk. However, I neglected to increase my level of exercise activity in the face of these new changes with my body. And, as a result, I slowly put on the pounds. But this post is not intended to be about weight. It is more about maintaining a certain level of activity. I sit. A lot. Often, a large portion of my time is spent in front of a computer. Additionally, when baking, I am typically stationary as I work for hours at a time standing in one place. Only trips to the oven and/or sink break up the monotony. So I had to consider alternatives for counteracting my lack of activity. In reality, however, the only alternative was to resume my exercises. Thus, I was inspired to begin my runs again, not only because I was getting older and wanted to improve my overall health but because I wanted to be active again. In March, I ran for the first time in over a year. It was so tough getting through that first day. My pounding heart, sore legs, hurting chest, and gasps for air did not help either. However, today, I felt great knowing that I could run for 3.25 miles without collapsing from exhaustion. It is my longest distance to date according to RunKeeper*; and, therefore, it is a mini milestone. RunKeeper sends notes every time a personal milestone is achieved. I am always up for a challenge; and maintaining a running routine has definitely been one. But the runs have also made my journey as a small business owner that much easier. How? By recognizing that I can do anything when the commitment is there. And committing to a running schedule has mandated one last important thing: that I prioritize each day’s events so that I have enough time and space to reach another milestone. Lexyne’s Note: If my words do not inspire you, then maybe this video from FLOTUS Michelle Obama’s Let’s Move campaign will. * I think RunKeeper is an excellent application that you can use to keep track of your progress when exercising. I have included it as part of all of my running activities and have found it to be a useful tool for maintaining activity goals. Disclaimer: I received no compensation from RunKeeper nor its affiliates. Inspiration is where you find it. There is something so magical about discovering your muse and bringing a vision to fruition. Some find inspiration in nature, others in a lover or close relative. Chicago-based artist Lauren Brescia found inspiration in what else? Cake! Pieces from Lauren Brescia's One Art, Please exhibit. Photos are courtesy of Omari Jackson. She used this inspiration to make beautiful works of art that resembled various confections including cakes and cupcakes in her gallery exhibit, One Art, Please, one of many galleries that are part of the Pop-Up Art Loop organization. The Pop-Up Art galleries are a clever example of how art can be displayed in the most unlikely places. In this case, empty storefronts around the Chicago Loop neighborhood are transformed to feature temporary art exhibits. Brescia’s exhibit served as the backdrop for the closing reception held in April–billed as One Cake, Please: An Edible Art Showcase and hosted by VelvetStyle Events–and allowed guests an opportunity to mix and mingle with the artist while sampling various cakes from local bakers. Savor Baking Company was thrilled to be part of the event (joining Crumbs BakeShop, The Bleeding Heart Bakery, and HoneyBee Cakes) as the sponsor of the station where guests were able to frost and/or decorate his or her own cupcake. I thoroughly enjoyed meeting every guest that stopped by the Savor table. Surprisingly, many were a little shy about using the pastry bag to frost a cupcake. However, those who did produced some amazing “edible” art. 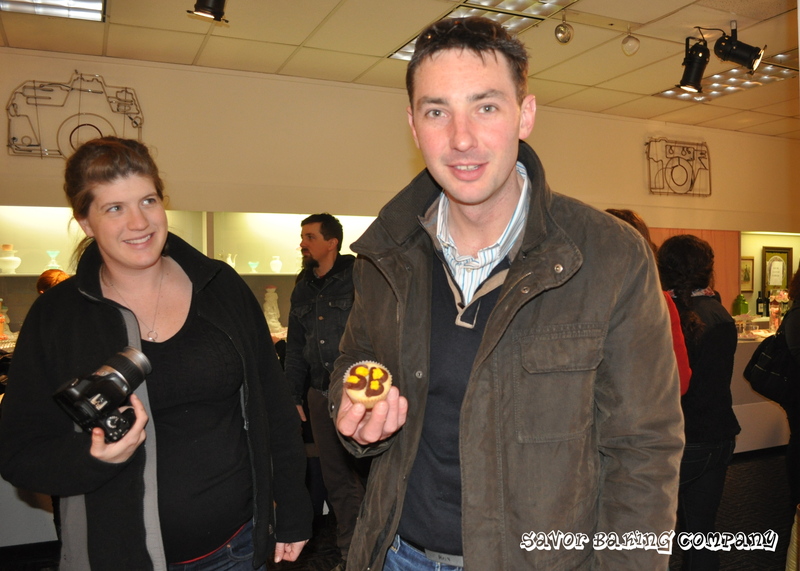 It was nice to be among like-minded cake and cupcake lovers for a change. We talked about all things cake: butter, sugar, eggs, frosting, sprinkles. The family-friendly event attracted about 150 people, about double initial estimates. So, it was definitely a packed house! Nonetheless, One Cake, Please proved to be a huge success! Many kudos to Tiffany English, Lauren, and everyone else involved with hosting the fantastic event! I have learned from my journey in bringing Savor Baking Company to life that it is necessary to take little steps. I mentioned in a previous post that I had a drastic career shift last year. I will not rehash details here. But that entire experience was a BIG (and I mean HUGE) change for me. I questioned my decision thousands of times, but I never regretted it. The decision, however, did lead me to seek advice from a career counselor. In hindsight, it was one of the best things that I could have done for myself. From those numerous meetings (thanks, Tracie!) I came away with a few pieces of sage advice, the most important of which was that it is okay to try something new. I know it sounds simple, but it spoke volumes to me. I remember having a conversation with Tracie regarding the desire to start what would become Savor and my trepidation surrounding the idea. She told me that rather jumping in to the proverbial water, that it was okay to put my “toe” in. The metaphor gave me enough confidence to push forward with the business idea albeit with smaller steps. I had many conversations with friends and family regarding my thoughts. And I tested a few recipes of different cakes and other pastry items. But I realized that I needed to hear from a pool of potential customers. So I decided to host a “dessert tasting” for friends and family at my condo. Pre-Dessert Tasting. I think this was at the end of Day 2. I spent a full three days preparing for the tasting by making multiple cakes and cookies. Thankfully, about 25 friends and family attended who were all eager to see what this party was about. (I will forever be grateful to them for doing so. Especially since I gave them over-baked food! Note: this was before I discovered the priceless necessity of an oven thermometer) I requested that everyone give honest feedback using a simple survey that I had made prior to the party. I determined that the feedback would be the deciding factor on whether or not to pursue the business any further. The feedback was overwhelmingly positive and encouraging! The confidence that I gained led me to begin the (next) big step of my small business journey: deciding on a name! Once I had the name figured out, it was almost like a snowball effect of new decisions to be made. But I’ll save the rest for future posts in the LSBO series (yeah, I know…great teaser, huh?). Anyway, the take-home lesson here is that it is perfectly normal to start small. Test out the waters with your toe first. If everything feels right after that, go on and sink your foot in. You will be glad you tried. Growing up in the South has had an immense influence on the products that I bake. Pound cakes and pies maintained a common presence on the Sunday dinner table. The best of these sweet treats were scratch-baked from memory, as family recipes were passed generally from generation to generation. However, there was one cake in particular that was sure to be the showpiece: THE RED VELVET CAKE. The most important question regarding this cake, of course, was “Who made it?”. Although the question may seem simple, it spoke volumes to the quality, taste, and freshness of the cake—not to mention the rate at which it would get eaten. Big Mama’s Red Velvet Cake was definitely the showstopper of the evening. And anyone who dared challenge her cake with one bought from the store was relegated to silent dismissals of naïveté. My earliest memories of eating Red Velvet Cake bring a smile to my face, as it was one of my favorite desserts to eat. What I did not know then was that this little cake would virtually transform the bakery world—and, in particular the cupcake niche—within a couple decades. Walk into any bakery or cupcake shop today and you are sure to find it on the menu. It is a standard by which many bakeries are measured. And it remains one of the most popular dessert items consumed across the country. So why is this “chocolate cake with a little bit of red food color, rather than a red cake with a little bit of chocolate” so popular? Your guess is as good as mine. No doubt, however, that the red filling paired with the creamy white frosting had something to do with it. It is definitely a combination that requires one to pause, look again, and cut a slice before it is gone! Although its origins are enigmatic (there is a controversy over whether this cake has southern origins or if it was first served at the Waldorf Astoria in New York City), it is definitely a cake that is sure to be featured prominently on any table. The recipe below is (what I believe to be) the original recipe from the Waldorf Astoria hotel. The original recipe is complemented with a frosting made with flour. I prefer Red Velvet Cake with Cream Cheese Frosting and have included a recipe for it below. Enjoy! Cream shortening, sugar and eggs. Make a paste with cocoa and food coloring. Add to the mixture. Add buttermilk and flour alternately. Add vanilla. Mix vinegar and baking soda. Fold the mixture into the batter. Pour into 3 or 4 greased and floured 8” cake pans. Bake at 350 F for 24-30 minutes. Frost with the red cake icing (see recipe below). Add milk to flour slowly, avoiding lumps. Cook the flour and milk until thick, stirring constantly. Cool completely! Beat the butter, sugar, and vanilla until creamy and fluffy. Beat the flour and butter mixtures together until very fluffy. Do not overbeat. Beat cream cheese, butter, salt, and vanilla in mixing bowl until light and fluffy. Slowly add powdered sugar by 1/2 cup quantities, mixing thoroughly after each addition. Combine until smooth and fluffy. This recipe should frost and fill the accompanying cake recipe or about 24 cupcakes. I celebrated a birthday earlier this month: number 32. I was grateful to my husband who cooked a nice dinner for me; and, I responded to all of my well-wishes from friends and family. Additionally, the temperatures were warm and the sun was shining in Chicago–it usually snows on my birthday–providing an overall lovely day. All in all, I felt that I was ready to take on the world, albeit a year older. As I always do on my birthday, I reflected on my life. Frankly, what I envisioned my life to be at this point never came to pass. I had lofty ideas five years ago: with my engineering PhD in hand, wearing fierce suits, I just knew by now that I would be on track to take over the corporate world. In reality, however, it did not quite happen that way. I am not stating all of this to begrudge my current state nor any decisions that I have made thus far. But a birthday post from a colleague gave me pause to reconsider my life again. As I thought more and more about my journey through life, I decided that not only am I getting older, I am getting better. I exchanged engineering school for culinary trial and error, cookbooks, and recipes. I traded the fierce suits for t-shirts and yoga pants. I swapped the corporate takeover for the entrepreneurial coup. And I am all the happier for it. Although leaving school was one of the most difficult decisions that I have ever made, I realized soon after that it was, perhaps, the best decision that I could have made. I have minimized my stress levels and replaced unhealthy eating–I am an emotional eater–with more healthy meals that I or my husband cook each day. I have started to exercise again in order to train for that elusive marathon that is on my bucket list. I have started a business, a personal dream of which I am incredibly proud. I have spent more time with family and friends whom I had begun to neglect due to school commitments. In particular, I have been able to strengthen my marriage, which was so important during this major transition. So, even though I experienced a few unconventional twists and turns as I got older, I believe that they have made me a better person. I feel that my experiences have given rise to someone who is eager to live life and recognizes each and every blessing. Perhaps the most important blessing of my getting older is that I have learned that I am happy. And, that is all that matters. A recent tweet from @steamykitchen made me think about organization. I try to keep myself organized as much as possible. Most of the time, I win. At other times…well, not so much. But, one place where my organization works is my spice shelf. I am quite the perfectionist about how the spice shelf is organized as I love to cook varying types of cuisines. So, as you can imagine, I have spices and herbs ranging from allspice to caraway seeds to turmeric. As soon as I buy a new spice, I label it. I borrowed the concept of spice organization from my cousin, Leslie. I remember visiting her home one evening during my college years in Atlanta and browsing through her kitchen for something to eat. She had this amazing rotating cabinet filled with just about every spice and herb available in the grocery store. Since the cabinet was below the counter, all one was able to view were the tops of the containers. So, her ingenious idea: write each name of the contents on the top of the container using a permanent marker. The idea is so simple, but yet very effective. 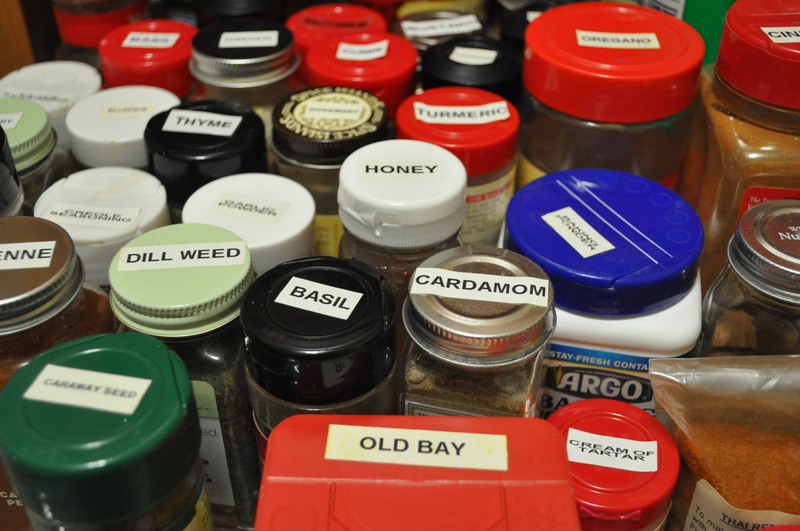 When I moved from the dorms and into my own apartment a few years later, I remembered Leslie’s spice cabinet and took it a step further with a label maker. The label maker (using the white tape) provides added flexibility to write in different font styles, font sizes, symbols, and on multiple lines, to name a few examples. So, with minimal effort, you can begin your career as an organizing pro in the kitchen! If you have other ideas on how to organize your kitchen (or life, in general), I would love to read about them. So, 2011 did not start off in the best way for me. The one bright spot of it is that my husband took me out to dinner and surprised me with a bouquet of roses and champagne when we returned home. We brought in the new year together amid minimal fanfare. It was simple, yet very nice and intimate. Then, the sniffles came. And the coughing. AND the body aches. On the morning of January 1st, I woke up feeling terrible. My state was not because of the food that I had eaten the previous night. I had what I dreaded most: influenza. Out of all of the days that I could have been sick, I did not want to begin the new year in this way. Nevertheless, I have a wonderful husband that took excellent care of me and helped to nurse me back to health. While I did not work for a solid week, I was able to concentrate on where I wanted to take Savor Baking Company in the next year. In between servings of excellent homemade chicken noodle soup (the recipe follows below), I made three simple goals for 2011. The first goal was to increase Savor’s online presence. I have made a commitment to post more content on this blog, facebook, as well as be more active on Savor’s Twitter account (follow me at @savorbakingco @savorbaking). The second goal was to be more visible in the community and at networking events. I will be sure to keep my website and social media outlets updated on where Savor will be for these occasions. The final goal is to be a better servant to YOU, the customer. I am constantly requesting feedback from my customers and have taken into account all that you have said thus far. Serving my customers is the most exciting part of my job; and, it is why I love doing what I do. I appreciate the faith that you have put into my business thus far. As always, I give thanks to you for taking this journey with me. Here is to a wonderful new year! Although chicken soup is quite popular to eat to help combat a cold, it can always be enjoyed any time of the year. My personal recipe is below. In a large pot bring chicken thighs, stock, oil, and spices to a rolling boil. Cover and reduce heat so that chicken continues to boil in the stock, about an hour. Stir occasionally. Add the vegetables and more water/stock, if necessary. Return to a soft boil and cook for 30 minutes more. Add the egg noodles to the soup and cook for about 8 more minutes. Stir to incorporate noodles evenly. Soup will have thickened slightly. Enjoy! * Chicken thighs are rich in flavor and perfect for a chicken soup recipe. However, chicken breasts are just as good and provide a healthy alternative.